Do you have photos, historical accounts or other items pertaining to the St. Francis area? Would you like to share this historical information with the world? LakesnWoods.com would like to publish your St. Francis photos (current or historical) or historical accounts on this website. Original materials can be returned and your privacy will be respected. St. Francis is a city in Anoka County, Minnesota. 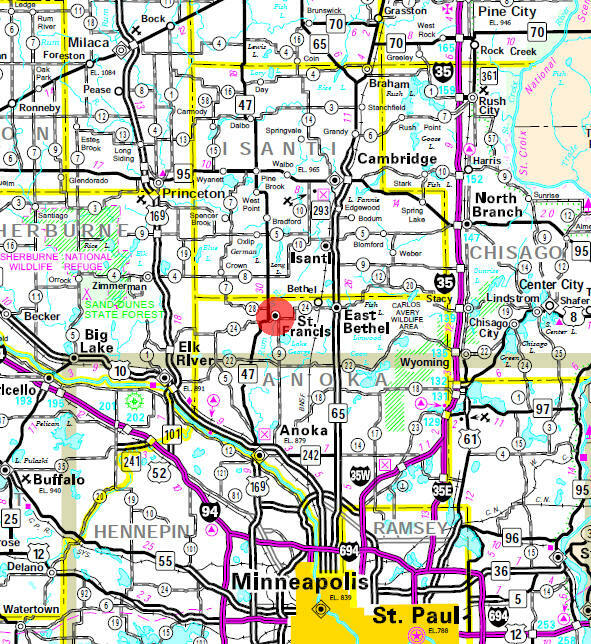 Minnesota State Highway 47 serves as a main arterial route in the city. According to the United States Census Bureau, the city has a total area of 23.7 square miles (61.5 km²), of which, 23.3 square miles (60.4 km²) of it is land and 0.4 square miles (1.1 km²) of it (1.73%) is water. The elevation is 919 ft (280 m) above sea level. As of the census of 2000, there were 4,910 people, 1,638 households, and 1,300 families residing in the city. The population density was 210.6 people per square mile (81.3/km²). There were 1,686 housing units at an average density of 72.3/sq mi (27.9/km²). The racial makeup of the city was 95.74% White, 0.22% African American, 0.73% Native American, 1.28% Asian, 0.04% Pacific Islander, 0.26% from other races, and 1.71% from two or more races. Hispanic or Latino of any race were 0.92% of the population. There were 1,638 households out of which 51.3% had children under the age of 18 living with them, 59.1% were married couples living together, 14.3% had a female householder with no husband present, and 20.6% were non-families. 13.3% of all households were made up of individuals and 3.1% had someone living alone who was 65 years of age or older. The average household size was 3.00 and the average family size was 3.27. In the city the population was spread out with 35.2% under the age of 18, 9.4% from 18 to 24, 37.2% from 25 to 44, 14.6% from 45 to 64, and 3.5% who were 65 years of age or older. The median age was 28 years. For every 100 females there were 98.6 males. For every 100 females age 18 and over, there were 97.8 males. The median income for a household in the city was $51,982, and the median income for a family was $52,193. Males had a median income of $40,585 versus $28,112 for females. The per capita income for the city was $19,957. About 3.0% of families and 4.8% of the population were below the poverty line, including 4.4% of those under age 18 and 5.0% of those age 65 or over. ST. FRANCIS Township, settled in 1855 and organized in 1857, bears the name given by Father Louis Hennepin in 1680 to the Rum River. It was transferred by Jonathan Carver in 1766 to the Elk River and now is borne by the chief northern tributary of that river. The name is in commemoration of St. Francis of Assisi in Italy, who was born in 1181 or 1182 and died in 1226, founder of the Franciscan order, to which Hennepin belonged. St. Francis, a city incorporated on May 16, 1962, was first settled in 1855 on the Rum River, which furnished power to extensive roller mills. Businesses included flour mills, general stores, corn canning, and potato starch factories. A post office was established in 1857, former names being Old Jonathan, St. Jonathan (1857 in Ramsey County), and Otona. The City Council meets the first and third Mondays of the Month at 6:00 pm. The meetings are currently held at the ISD #15 District Office located at 4115 Ambassador Blvd.